Green Tea Extract, made from the Camellia sinensis plant, has a history of use in a number of Asian countries; though its very first use originated in traditional Chinese Medicine. There is evidence of its use in Indian medicine as well. Green Tea is actually made from the same leaves used to make oolong tea, white tea and black tea. The difference, however, is that the Camellia sinensis leaves used to make Green Tea Extract have not undergone the same withering and oxidation process as its counterparts. According to the University of Maryland Medical Center, research has suggested that oxidative damage caused by free radicals may contribute to aging and other potential health issues. However, the catechins found in green tea extract may support neutralizing these free radicals. Green Tea Extract has become a popular antioxidant supplement with a number of reported health benefits believed to be obtained via its polyphenols (also known as catechins). Made from the Camellia sinensis plant, there are a number of reported Green Tea Extract benefits. The polyphenols and catechins have been shown to induce thermogenesis which in turn may helps regulate body fat levels and metabolism. Other evidence has suggested Green Tea Extract has antioxidant and immune-boosting properties. It may also support cardiovascular health. If the Green Tea consumed contains enough caffeine, it may also be used as a natural coffee alternative. It's important to note, however, that Green Tea Extracts that contain high EGCG content typically have very little caffeine in them. Green Tea Extract as a natural nootropic: One human study has suggested that the EGCG in Green Tea Extract may help protect brain cells from oxidative stress. An additional human study suggested that Green Tea Extract may promote healthy brain function and task performance. Green Tea extract for weight loss: Green Tea Extract supplementation may support weight loss. Catechins (and caffeine) have been shown to induce thermogenesis which is a metabolic process in which our bodies burn calories to product heat. This, in turn, may promote weight loss. Green Tea Extract as a workout supplement: Green Tea Extract may promote exercise performance and recovery. In one human study 14 men that took a Green Tea Extract supplement for four weeks increased their running distances, on average, by 10.9%. An additional study featuring 16 male runners who also took a Green Tea Extract supplement for 4 weeks indicated protection against oxidative stress from repeated sprinting. Green Tea Extract may promote heart health: A 2012 human study featuring 56 overweight participants found that a 379mg Green Tea Extract dosage may promote cardiovascular health when compared to the placebo group. An additional study featuring 33 healthy participants found that Green Tea Extract may support healthy cholesterol levels. What Are Green Tea Extract Catechins And Why Are They Important? Green Tea catechins are made up of the four molecules listed below, the most potent of which is believed to be EGCG (Epigallocatechin Gallate). 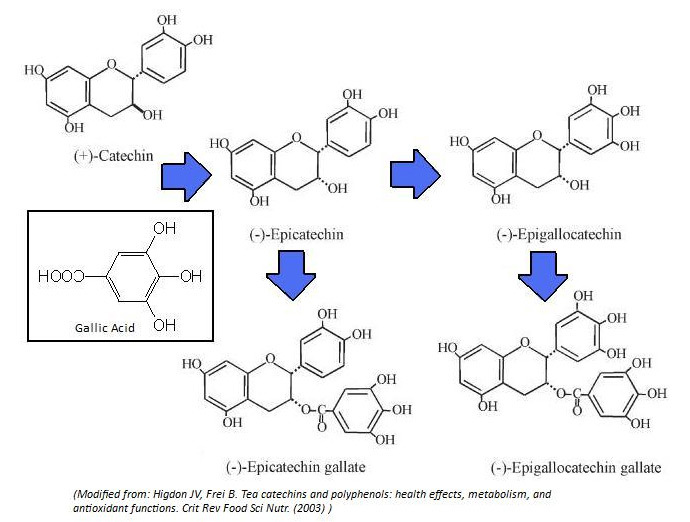 Epicatechin and Epigallocatechin, pictured below, can become acylated with gallic acid to form gallates (11). The best Green Tea Extract supplements available to buy usually specify their catechin and/or EGCG content. Without that information available, it is difficult to know if a particular Green Tea Extract supplement has high EGCG content or is simply ground up or powdered tea leaves. While its reported that one brewed cup of Green Tea may contain anywhere from 35-100mg of Caffeine, the amount of caffeine in a concentrated Green Tea Extract can vary quite a bit. In fact, Green Tea Extracts that have high EGCG content, such as Nootropics Depot's 50% EGCG extract, tend to actually have very trace amounts of caffeine in them. How Much EGCG is in Green Tea Extract? This Green Tea Extract supplement is approximately 50% EGCG. As a dietary supplement, take 350mg of Green Tea Extract once daily. Green Tea Extract's bioavailability may be increased when paired with a fish oil supplement. Green Tea Extract may also have synergistic effects when paired with a CoQ10 supplement, a Curcumin Extract or L-Theanine. Nootropics Depot offers 125g or 250g jars of high quality Green Tea Extract Powder. Nootropics Depot's Green Tea Extract has been lab-tested and verified for both product purity and identity. To gain more insight, read the Green Tea Extract reviews and experiences below. Please make capsule versions of this. This is the single most awful tasting powder on this site and it sticks long on your tongue after you swish it down. And I don't feel much difference. love ND but this isn't a good idea in my opinion to do a powder form of this, back to the pills. High quality and effective. If nothing else works try this. Am satisfied that it worked, but not itself a cure. Restored mental sharpness. Considering my dose being between 400-800 mg a day, the price on this stuff is really great! The taste is kind of harsh and it is somewhat difficult to mix. But it's effects on curbing appetite and boosting metabolism are worth the moments of nasty taste.